As the first week of June approaches, local high school seniors are anticipating the “seal the deal” moment of their high school careers as they’ll march to the beat of “Pomp and Circumstance,” receive their diplomas, and toss their caps high up into the air. Before that day, seniors are wrapped up in their final moments of high school: graduation rehearsals, year book signings, receptions and other senior activities take place. Within these last moments, students are consumed with a mixture of emotions and are left to reflect on their high school careers, including the ups and the downs. As the graduating class of 2017’s year comes to a close, seniors of Attleboro High School would like to share advice with the upcoming freshman class of 2021 on what they enjoyed, what could’ve gone better, and the memories they’ll cherish for the rest of their lives. For Goldstein, she strongly believes that her self advocacy was a major reason for her success in high school. “Gravitate toward whatever makes you feel like you, and you will go far,” she said, adding, “It’s okay to be scared. Even the guys who stand at 6’5’’ were once scared, just always know that everyone has a place and there’s something for everyone in high school. Staying true to who you are is something that pulled at the heartstrings of AHS senior Kevin Chenard throughout his high school career. Join any after school activity you can, whether it’s student council, a sport or club Vieira said. She thought her times during track and soccer were where she made her best memories, and formed the strongest friendships. AHS senior Stephanie Pan, who will be attending the Massachusetts College of Arts and Design in September, said she will miss all the high school events, including dances, fundraisers, concerts, plays and sporting events. This entry was posted in Home on May 25, 2017 by abeeahs. Power down, but the prom must go on. Late Friday afternoon panic swept across the Attleboro area when a massive power failure brought high school teens getting ready for their junior prom to a standstill. The power failure, caused when a tree fell on a transmission line in Cumberland, cut power to more than 24,000 homes and businesses in Attleboro, Plainville, Seekonk and Rehoboth. Attleboro High School junior, Emily Saulnier was about to do her hair for prom when the power suddenly went out in her home near Wamsutta Middle School. If you know anything about prom hair, it takes not only a lot of hairspray and bobby pins but electricity as well, as many girls use hair straighteners, blow dryers and curlers for the perfect do. With wet hair, Saulnier ran outside to the light where she started her makeup, all the while thinking of a Plan B for her hair. “I was going to braid it so that once it was dry it would be wavy or at least somewhat close to what I was planning it to look like,” she said. Luckily for Saulnier, power was restored and she was able to finish her hair and get to her prom at the Taunton Holiday Inn by 6 p.m. Immediately after Fraielli put the finishing touches on it, curling her last few strands, the power went out. “I don’t know what I would’ve done if it went out any earlier,” she said. AHS senior Andrew Gingras said the power failure was almost a blessing in disguise. Right when he walked into his date’s home to take photos, all the lights turned off. “It was inconvenient, but it got me out of taking some photos, which was pretty cool,” Gingras said with a laugh. But his escape was short-lived as he and his date later joined other prom-goers at Capron Park for a photo shoot. Across the street from the park, while Gingras and friends wrapped up their photo shoots, businesses on County street were in a panic. A D&M pizza worker said the restaurant was in chaos as delivery orders had to be canceled due to the ovens not working. “What an inconvenience,” said the worker who declined to be identified. Next door workers at Honey Dew Donuts lost several customers because coffee could not be brewed. This entry was posted in Home on May 22, 2017 by abeeahs. A gadget designed to help kids with ADHD focus has become so distracting that it’s being banned in many schools. 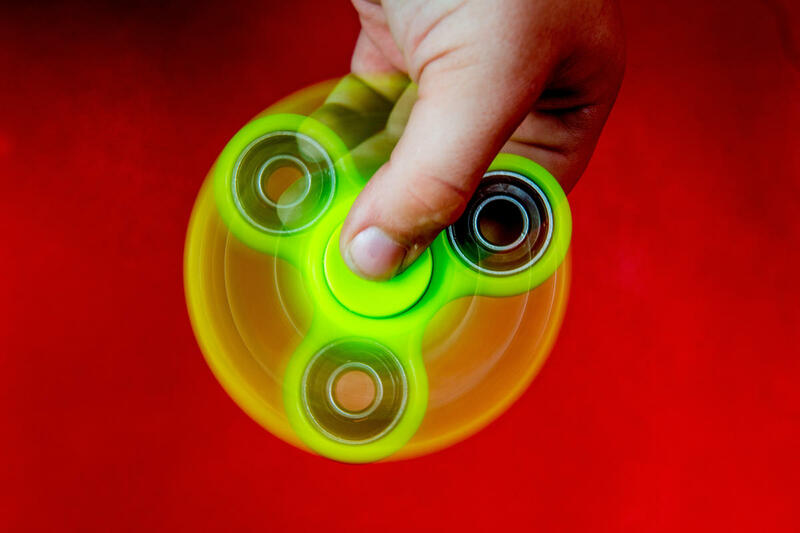 Sales of fidget spinners — a small, handheld gadget resembling a mini fan with three weighted prongs that, when gripped with the thumb and middle finger, will spin around and around and around — has exploded and become the must-have item for children and teens. The gadget was designed in the 1990s to help children struggling with ADHD, anxiety and autism. Now, 20 years later, it’s become one of the most popular items in the toy industry. Keith Lambert, owner of New England Novelty — a vendor that sets up sales tents and specializes in selling sports apparel and holiday flowers in the Attleboro area — is not just selling flowers this Mother’s Day weekend, but fidget spinners, too. All week, Lambert sold fidget spinners at his tents dotted throughout the Attleboro area, including one that was set up next to the D’angelo’s sub shop in South Attleboro. Several months ago, Lambert ordered his first shipment of spinners after fellow salesmen in the area told him it was going to be the next big thing. “My initial reaction was that it was going to sell just like every other toy, but boy was I wrong,” he said. Now Lambert is receiving shipments every day, and with each shipment, his stands will sell out in hours. “It’s all because of the kids, and once they have one, they want another, whether it’s a different color, or one that lights up,” he said. Dylan Ilkowitz, a senior at Attleboro High School, bought his fidget spinner for $6 at a Mansfield convenience store. “I just bought one as a joke really and because it’s become a huge fad, but after I bought it, I realized it’s actually really fun and satisfying to mess around with,” he said. But that “fun” is getting to many students and teachers, according to Dylan Nisbet, an eighth-grader at Brennan Middle School in Attleboro. “I usually use it mindlessly through the day, but some kids just won’t put them down,” he said. And it’s this obsessive playing that has stirred issues in some schools. Charley McKenna, a seventh-grader at Coelho Middle School in Attleboro, said she’s relieved that her school decided to ban the spinners in class unless it is used for a specific purpose, like managing ADHD. “During class, all I could hear was the spinning of the fidget spinners and many of my friends couldn’t concentrate,” McKenna said. And during lunch and passing time in the halls when fidget spinning is allowed: “Everyone is using them,” she said. Like Coelho, Brennan and Wamsutta also banned the item unless a student has a documented need to use the spinners during class. The issue hasn’t yet become a problem at the high school level. Christine Ouimet, 33, of Attleboro and mother of three, recently uploaded a video on Facebook of her son showing off some of his talented fidget spinning tricks. In slow-motion, she captured her 12-year-old spinning the gadget using only his pointer finger before he threw it up in the air. Ouimet said her children use their spinners often around the house, but she recently barred them from bringing the toys to school. “I feel like it was getting to be too much of a problem,” said Ouimet, adding that she sympathizes with teachers who have to discipline a class of students who won’t stop using their spinners. “It has gone a little crazy and it’s not being used as it was intended to be,” she said. This entry was posted in Home on May 15, 2017 by abeeahs. Submitted Photo of Tyler Koppy, a senior at AHS, promposing. The term “promposal” has taken the Internet by storm, circulating in the halls of high-schools and across the country as teenagers find elaborate and public ways to ask their dates to prom. It’s no longer a simple “Will you go to prom with me?” but a complex, witty, and sometimes eyebrow-raising way of asking. The phrase was first used in 2001 by the Dallas Morning News, as the paper commented on ways students were asking their dates to prom, and with the introduction of social media websites like Facebook,Twitter, and Instagram the term went viral as high schoolers shared their promposals to the cyber world. And now, the idea of “promposing” has spread like wild-fire. Attleboro High School senior Marissa Dias was asked to prom in a way she said she would’ve never expected. When she walked into her date’s house she was greeted with a sign that read, “You betta go to prom with me,” and sitting next to him was a fish tank with a Betta fish in it. Indeed she does, a pet that will be a constant reminder of the day she was promposed to, Dias said. AHS senior Owen Scannell decided to use two Corgi puppies to seal the deal with his date. Scannell got the idea to use Corgi puppies in his promposal because his date had an obsession with the breed. Luckily, he was able to find a friend to lend the dogs so he could finalize his plan. AHS alum and University of Massachusetts freshman, Dante Arcese, went viral last year when he designed his promposal based off of rap sensation, Drake’s, album cover. Even Drake’s online blog shared the photo of Arcese’s promposal. “It was crazy to see the thousands of retweets and favorites it was getting,” said Arcese, whose promposal was shared over 25,000 times. Ryan Ringler, a senior at AHS, asked Kathryn LeBlanc, also a senior at AHS, to prom while they were on a school trip to Portugal and Spain over April vacation. Throughout the week, Ringler had a friend take photos on a Polaroid camera of Leblanc and himself at varying destinations they visited. Once the vacation was nearly over, Ringler aligned the photos and spelled out “PROM?” on the pictures. “Promposing emphasizes the fact that you care and took the time to actually put thought into asking your special someone to prom. It is more exciting and simply means more to the person you’re asking,” Ringler said. This entry was posted in Home on May 9, 2017 by abeeahs. Netflix’s new drama,‘13 Reasons Why has been added to many high-schoolers’ binge-watch lists, making it one of the most popular series of the year. But the show’s graphic depiction of teen suicide has left local teens divided — both criticizing and praising the show’s intentions. The 13-episode series follows the suicide story of Hannah Baker, a 17-year-old who leaves behind 13 recorded tapes, each explaining a reason for her suicide. The show covers heavy topics including: bullying, sexual assault and depression, building up to the final episode — a graphic depiction of Baker’s suicide. The controversy surrounding the show is a major topic of discussion in high schools across the country and locally among administration, guidance counselors, and of course — students. At Attleboro High School, high school seniors are divided on their opinions of the show, some arguing that the storyline is an accurate representation of what goes on in the life of a high school student, while others argue that its dramatized representation of suicide goes too far. Kyla Mucciarone, 18, recently finished the Netflix series and said it left her thinking. “(It) gives a deeper insight into the mind of someone who is suffering from depression and shows that you never really know what’s going on in someone’s life,” she said. The golden rule: “Treat others the way you want to be treated,” was a message Noah Sweeney, 17, said he took away from the show. Mucciarone and Sweeney both said although the series was extremely difficult to watch, its message about depression was eye-opening. Others were disturbed watching the series, finding themselves unable to stomach some of the topics covered, especially Baker’s suicide. For Cassie Cabral, 17, the final episode proved the most difficult to watch. “I found myself looking away from the device I was watching it on. It was very scary. It was not something I wanted to watch someone do to themselves,” she said. Other students agreed, and said the show’s depiction of suicide could be dangerous to someone suffering from mental illness. Cooper also said the show should present more ideas about finding help and dealing with depression realistically. The storyline caused concern for at least one student. Owen Scannell, 17, said he has suffered from depression throughout his youth. “‘13 Reasons Why glorifies suicide in a world where kids learn more from media than in school, and that terrifies me,” he said. Scannell said he was lucky enough to have a strong support system who helped him in his times of need. In times of depression, Scannell knows first-hand how sensitive people can be, and he is concerned that people struggling with depression are putting themselves at risk by watching the show. Oh the places they’ll go… Congrats to the senior class on their decisions for the future! Above is a picture of the wall where students have signed their names, writing where they’ll be heading in the future. This entry was posted in Home on May 3, 2017 by abeeahs. Rules made official by AHS Senior Marissa Dias. 1) It will cost $5.00 to play. The winner will take home half of the total money and the other half will be donated to this year’s Special Olympics. 3) In order to eliminate your “target”, you must soak them with a visible amount of water from a water gun. After they are out, they must tell you who their target was and you inherit their target. School Grounds-The only exception to this rule is that the fields and tennis courts become fair game after 4:30 p.m. DO NOT BRING A WATER GUN INTO THE SCHOOL. Cars- The target is only safe within their own car. If they are in anyone else’s car, it is fair game. Work- The target is safe during, and on their way to work. However, as soon as they are off of their shift or step out of work, they are fair game. 6) The assassin must have a video of the elimination, a picture of the target after being eliminated, or at LEAST another witness. (The proof will be used to make a montage at the end of the game.) If anyone has a Go-Pro…. That would be awesome. You must update the Facebook page with the picture, video, or status as soon as you can after eliminating your target in order to keep the information as recent as possible. You cannot get your next target until the last one you got has been posted. 7) Your targets will be chosen at random by someone who is not playing in the game. 8) Once your $5.00 has been collected, your name will be added to the list of participants. 9) IT MUST BE WATER. Do not put anything else in the water gun. It will not count. 10) If you are eliminated, be honest about it. Don’t ruin the game and make it into an issue. 11) Don’t do anything stupid, don’t ruin the game for yourself & everyone else, and have fun! *Other dates will be added as the game goes along as well as surprise twists. *The last day of classes will be the last day of the game. If there is only one person remaining, they will be declared the winner. If there is more than one individual left at midnight on the last day of classes, the individual with the most points will be declared the winner. This entry was posted in Home on April 10, 2017 by abeeahs.